What Went Wrong With The Articles? The Articles of Confederation satisfied the desire of those in the new nation who wanted a weak central government with limited power. Ironically, however, their very success led to their undoing. It soon became apparent that, while they protected the sovereignty of the states, the Articles had created a central government too weak to function effectively. One of the biggest problems was that the national government had no power to impose taxes. To avoid any perception of “taxation without representation,” the Articles of Confederation allowed only state governments to levy taxes. To pay for its expenses, the national government had to request money from the states, which were required to provide funds in proportion to the value of the land within their borders. The states, however, were often negligent in this duty, and the national government was underfunded. Without money, it could not pay debts owed from the Revolution and had trouble conducting foreign affairs. For example, the inability of the U.S. government to raise sufficient funds to compensate colonists who had remained loyal to Great Britain for their property losses during and after the American Revolution was one of the reasons the British refused to evacuate the land west of the Appalachians. The new nation was also unable to protect American ships from attacks by the Barbary pirates. Foreign governments were also, understandably, reluctant to loan money to a nation that might never repay it because it lacked the ability to tax its citizens. The fiscal problems of the central government meant that the currency it issued, called the Continental, was largely worthless and people were reluctant to use it. Furthermore, while the Articles of Confederation had given the national government the power to coin money, they had not prohibited the states from doing so as well. As a result, numerous state banks issued their own banknotes, which had the same problems as the Continental. People who were unfamiliar with the reputation of the banks that had issued the banknotes often refused to accept them as currency. This reluctance, together with the overwhelming debts of the states, crippled the young nation’s economy. The country’s economic woes were made worse by the fact that the central government also lacked the power to impose tariffs on foreign imports or regulate interstate commerce. Thus, it was unable to prevent British merchants from flooding the U.S. market with low-priced goods after the Revolution, and American producers suffered from the competition. Compounding the problem, states often imposed tariffs on items produced by other states and otherwise interfered with their neighbors’ trade. The national government also lacked the power to raise an army or navy. Fears of a standing army in the employ of a tyrannical government had led the writers of the Articles of Confederation to leave defense largely to the states. Although the central government could declare war and agree to peace, it had to depend upon the states to provide soldiers. If state governors chose not to honor the national government’s request, the country would lack an adequate defense. This was quite dangerous at a time when England and Spain still controlled large portions of North America. The Articles of Confederation suffered from many problems that could not be easily repaired. The biggest problem was the lack of power given to the national government. The national government could not impose taxes on citizens. It could only request money from the states. Requests for money were usually not honored. As a result, the national government did not have money to pay for national defense or fulfill its other responsibilities. The national government could not regulate foreign trade or interstate commerce. The government could not prevent foreign countries from hurting American competitors by shipping inexpensive products to the United States. It could not prevent states from passing laws that interfered with domestic trade. The national government could not raise an army. It had to request the states to send men. State governments could choose not to honor Congress’s request for troops. This would make it hard to defend the nation. Each state had only one vote in Congress regardless of its size. Populous states were less well represented. The Articles could not be changed without a unanimous vote to do so. Problems with the Articles could not be easily fixed. There was no national judicial system. Judiciaries are important enforcers of national government power. The weaknesses of the Articles of Confederation, already recognized by many, became apparent to all as a result of an uprising of Massachusetts farmers, led by Daniel Shays. Known as Shays’ Rebellion, the incident panicked the governor of Massachusetts, who called upon the national government for assistance. However, with no power to raise an army, the government had no troops at its disposal. After several months, Massachusetts crushed the uprising with the help of local militias and privately funded armies, but wealthy people were frightened by this display of unrest on the part of poor men and by similar incidents taking place in other states. To find a solution and resolve problems related to commerce, members of Congress called for a revision of the Articles of Confederation. In the summer of 1786, farmers in western Massachusetts were heavily in debt, facing imprisonment and the loss of their lands. They owed taxes that had gone unpaid while they were away fighting the British during the Revolution. The Continental Congress had promised to pay them for their service, but the national government did not have sufficient money. Moreover, the farmers were unable to meet the onerous new tax burden Massachusetts imposed in order to pay its own debts from the Revolution. Led by Daniel Shays, the heavily indebted farmers marched to a local courthouse demanding relief. Faced with the refusal of many Massachusetts militiamen to arrest the rebels, with whom they sympathized, Governor James Bowdoin called upon the national government for aid, but none was available. The uprising was finally brought to an end the following year by a privately funded militia after the protestors’ unsuccessful attempt to raid the Springfield Armory. 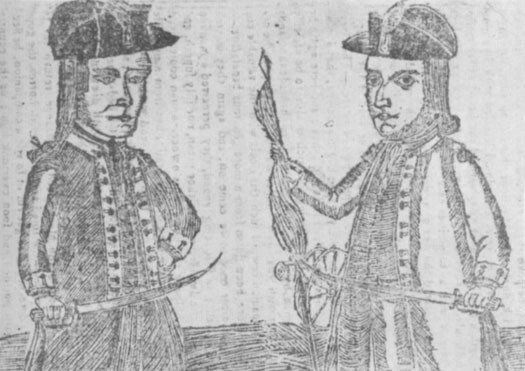 This contemporary depiction of Continental Army veteran Daniel Shays (left) and Job Shattuck (right), who led an uprising of Massachusetts farmers in 1786–1787 that prompted calls for a stronger national government, appeared on the cover of Bickerstaff’s Genuine Boston Almanack for 1787. Were Shays and his followers justified in their attacks on the government of Massachusetts? What rights might they have sought to protect? Fearful of creating a system so powerful that it might abuse its citizens, the men who drafted the Articles of Confederation deliberately sought to limit the powers of the national government. The states maintained the right to govern their residents, while the national government could declare war, coin money, and conduct foreign affairs but little else. Its inability to impose taxes, regulate commerce, or raise an army hindered its ability to defend the nation or pay its debts. A solution had to be found. In what ways did Shays’ Rebellion reveal the weaknesses of the Articles of Confederation? "American Government", OpenStax, OpenStax; Rice University. https://cnx.org/contents/W8wOWXNF@12.1:Y1CfqFju@5/Preface, CC BY. License Terms: Download for free at http://cnx.org/contents/9e28f580-0d1b-4d72-8795-c48329947ac2@1. This is a lesson from the tutorial, American Constitutions and Origins and you are encouraged to log in or register, so that you can track your progress.